Our new JPH freshman residence hall opened Fall 2014. This facility is located directly on-campus, with amazing views of Auke Lake, Mendenhall Glacier, and the numerous mountains, trees, and wildlife that surround the Juneau campus. With 120 bed spaces spread out across four floors of two-bedroom, suite-style units, this building will be a hub of activities, social connections, and access to educational services on-campus. View a few photos of the new facility in our campus photo gallery. Required placement for students under the age of 21 and entering the Fall semester with less than 24 credits. In addition to resident units, this 34,000 square foot facility offers lounge spaces, study nooks, a seminar classroom, community kitchen, laundry facilities, student mailboxes, and interior access to garbage and recycling disposal. A front desk location will not only allow for monitoring of student and guest access to this swipe-card access secured building, but also be a source of information and referral for residents. Our Banfield Hall residence hall is a similar two-bedroom, suite style facility. Located in the Student Housing Complex near our Housing Lodge and apartment units, Banfield Hall offers residents private rooms at a rate similar to our other comparable shared bedroom unit types. We also have exciting renovations taking place within our Banfield Hall facility. Some of these renovations include a new, larger community kitchen facility, newly created dining and study areas, and new lounge furniture. All housing residents are required to purchase a meal plan. To learn more about our food options on campus, please visit the Campus Dining page. These are apartments with four private bedrooms. Resident occupies one private bedroom within the overall unit. A total of four residents reside in each apartment, sharing a bathroom and common areas that include: a full kitchen with oven/stove range, full-size refrigerator, microwave, and abundant cabinetry storage space; furnished living with couch, loveseat, chair, and coffee/end tables; furnished dining room with kitchen table and chairs; and a large storage room. Residents share a two-person bedroom within a two-bedroom apartment. Optional private bedroom requests can be made at an additional rate to the requesting resident of $900 per semester. 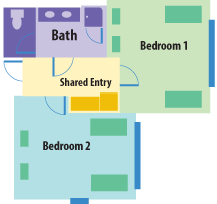 A total of four residents may reside in a two-bedroom apartment unit (dependent upon number of private room requests). Residents share a bathroom and common areas that include: a full kitchen with oven/stove range, full-size refrigerator, microwave, and abundant cabinetry storage space; furnished living with couch, loveseat, chair, and coffee/end tables; furnished dining room with kitchen table and chairs; and a large storage room. Washer and dryer utility hook-ups are present in the storage room of our two-bedroom apartment units – residents must supply and are responsible for their own appliances. 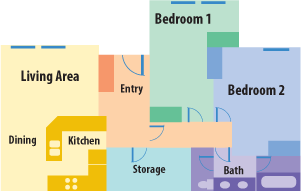 All apartments are equipped with microwave, stove, and refrigerator. The common space in each apartment is fully furnished with couches, dining room table, and chairs. Each bedroom is furnished with a twin extra-long bed, dresser, and desk (double rooms with 2 of each). Each apartment has a storage room in the entry way. The townhouse-style apartments also have storage underneath the stairs. Family housing at UAS offers students with partners and/or children a wonderful living environment. There are numerous benefits to living on-campus, beyond simple convenience. Opportunities to develop connections with other residents, as well as faculty and staff can be vital to creating a supportive network and resources in your education. The Residence Life department’s goal is to provide a living environment that focuses on academic success. We do this by creating and maintaining comfortable homes for our students, through policies and procedures that encourage learning and studies, and by implementing programs and events that challenge our residents to reflect upon their growth. Furthermore, Family Housing provides an opportunity to create their own environment within one of our apartment units while taking part in the opportunities provided by our larger Housing community. Family Housing units are two-bedroom apartments. All apartments are equipped with a full kitchen consisting of a microwave, stove, refrigerator, and plenty of cabinet space for storage. The living room in each apartment is fully furnished with couches, dining room table, and chairs. Each bedroom is furnished with a two twin extra-long beds, two dressers, and two desks. Each apartment has a storage room in the entry way and two-bedroom apartments have hook-ups for a washer and dryer if a resident chooses to provide those appliances on their own. The townhouse-style apartments also have storage underneath the stairs.